How The Other Half Loves closes this Sunday with a 2pm matinee. Why not come to the show tonight and make an arts night out of it? Before the 8:00pm show at the Playhouse, stop by the opening reception for Six Summit Gallery’s Connecticut Women Artists Invitational Exhibition from 6 to 9 p.m. Six Summit is a beautiful new, diverse gallery located right across the street from the Playhouse. 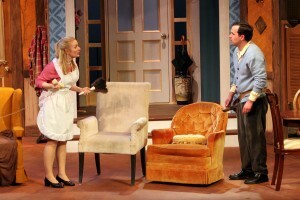 Call 860.767.7318 for tickets to How The Other Half Loves. Don’t miss this hilarious show!!! To celebrate the Ivoryton Playhouse production of Alan Ayckbourn’s hilarious comedy How The Other Half Loves – oh yeah and that small, intimate event taking place over the pond – the Playhouse is offering a Wedding Day Special. Don your most dapper chapeaux and come to the Ivoryton Playhouse on Friday, April 29, 2011 for the 8:00pm performance to receive $5 off adult and senior priced tickets. Wear any style wedding attire to receive discounted entry into the show! It’s a bit of fun. A bit of dress up. A bit of great theatre! For more information please call the box office at 860.767.7318. A well constructed lie can take on a life of its own once it is cast out into the universe. Very soon the truth will be obscured and rumor and conjecture will abound, causing confusion, consternation and, sometimes, a lot of comic consequences. 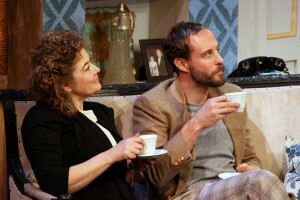 Such is the delightful result when Alan Ayckbourn’s British comedy “How the Other Half Loves” creates a flimsy fabrication of fibs about infidelity at the Ivoryton Playhouse until Sunday, May 1. 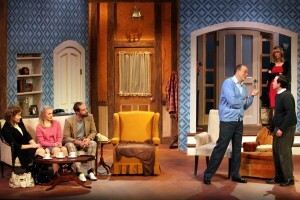 On an inspired set by Tony Andrea two households are intertwined: Frank and Fiona Foster (Bill Kux and Jacqueline Hubbard) in elegant shades of blue and Bob and Terry Phillips (Nick Stevenson and Beverley Taylor) in peasant browns. Bob works for Frank and is carrying on an illicit affair with Frank’s wife. Unfortunately Fiona misses her own wedding anniversary when she is busy with Bob and Terry confronts Bob for an explanation as to why he came home drunk at 2 a.m. Into the valley of the shadow of untruths are swept a totally innocent couple, Mary and William Detweiler (Alanna Wilson and B. Brian Argotsinger). William also works for Frank’s company and has just been promoted into his department. At simultaneous dinner parties, which you have to see to believe, the Detweilers are the guests of both the Fosters and the Phillips and the results, culinary and otherwise, are disasterously funny. The Detweilers have become, unbeknownst to themselves, the excuses for Fiona and Bob’s absences from home, as both claimed they were helping Mary and Bill with their marital problems. Lawrence Thelen directs this marital merry-go-round with a mischievous hand. For tickets ($40, seniors $35, students $20, children $15), call the Ivoryton Playhouse, 103 Main Street, Ivoryton at 860- 767-7318 or online at www.ivorytonplayhouse.org. Performances are Thursday at 7:30 p.m., and Friday and Saturday at 8 p.m and Sunday at 2 p.m..
Let this trio of couples demonstrate how to repair toothbrushes, clogged drains and broken marriages with skill, a screwdriver and plenty of duct tape. 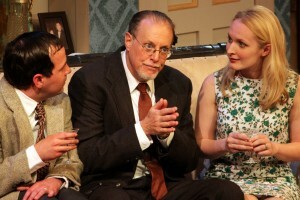 Don’t miss How The Other Half Loves now playing at the Ivoryton Playhouse. Performance times this weekend: Friday (22nd) and Saturday (23rd) at 8:00pm. There will be no performance on Easter Sunday (April 24). The show runs until Sunday, May 1. Treat yourself to a great night out – get yourself down to the Playhouse for some laughs! How The Other Half Loves, playing until May 1st at the Ivoryton Playhouse, is a laugh-out-loud comedy, with so much thrown at you by six wildly talented actors that while you are catching your breath, your head is spinning! This play is not simply your run-of-the-mill witty English drawing room comedy. Far from it! Playwright Alan Ayckbourn’s furiously fast formula for fun is a madcap romp, pitting three couples against time and space with a series of misunderstandings and hilarious consequences, unsuspecting dupes, guilty lovers and suspicious alibis. The play gleefully turns “wit” upside down and backwards, and instead of a drawing room, scenic designer Tony Andrea has ingeniously blended the furnishings of two homes – two living rooms, two dining rooms, even two foyers and front doors –into one cohesive set. Confusing? Not really. The Playbill warns that “even though intertwined at times, it’s as if there are two different plays being performed simultaneously – Good Luck!” Yet the writing and the way it is played (by one of the best ensemble casts we’ve ever had the joy of seeing onstage) and how it’s brilliantly directed –especially via the skillful blocking – by Lawrence Thelen, makes this show visually and audibly easy to follow. 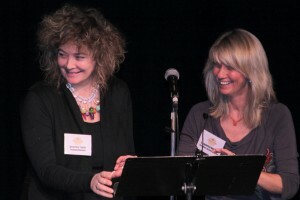 The ensemble company features Executive/Artistic Director/Actor Jacqui Hubbard as Fiona Foster, and Company Manager/Actor Beverly Taylor as Theresa, the wife of Bob Phillips. Bob and Fiona are having an affair, and Theresa suspects nothing. These talented women not only keep the Ivoryton Playhouse vibrant and lively behind the scenes as theater management professionals, but who ever knew they both had such deft acting chops? Joining Jacqui and Beverley on the boards is hilarious Nick Stevenson as the mostly hung-over Bob, brilliant comic actor Bill Klux as the flummoxed and fastidious ‘hasn’t got a clue’ Frank, B. Brian Argotsinger’s nerve-wracked performance as timidly innocent William, and Alanna Wilson’s painfully shy portrayal as Mary who becomes the catalyst for most of the misunderstanding and mirth.. The four latter actors are all members of Actors Equity. LisaMarie Harry’s costume design defines the characters perfectly – from dowdy Theresa’s red fluffy slippers to elegant Fiona’s ‘Carnaby Street’ fashion look. Dressing the locks of Theresa, Fiona and Mary, Joel Silvestro’s wig and hair design totally identifies these as middle-class British women. Doug Harry’s lighting design keeps the set light, bright and easy-on-the-eyes to catch all the action. The hour of the day is defined by a spotlighted cuckoo clock – cleverly opening scenes to remind us of what time and which day it is. And that cuckoo’s incessant “coo” is only possible through the sound design of Tate R. Burmeister, who has also made certain that every spoken word can be heard clearly and distinctly. The stage management of T. Rick Jones keeps the dark time between scenes to a minimum, and the unseen crew is lightening fast and efficient to make sure that all the wine glasses, plates, drinks, toys, porta-prams, screwdrivers and toothbrushes are where they are supposed to be at all times! Props galore! This play is for anyone who is in a “couples” relationship – of any stripe. The universal joys, annoyances, day-to-day frustrations, the little love and affection moments, plus the intrigues, are all illustrated here, mostly with rousingly laughable effects. How The Other Half Loves runs thru May 1st. Matinees are Wednesday and Sunday at 2 pm. Evening performances are Wednesday and Thursday at 7:30 pm, Friday and Saturday at 8 pm. Tickets are $40 for adults, $35 for seniors, $20 for students and $15 for children. Call the Playhouse box office at 860-767-7318 or visit the website at www.ivorytonplayhouse.org The Playhouse is located at 103 Main Street in Ivoryton, Connecticut. Help the Ivoryton celebrate its 100th Birthday by seeing How The Other Half Loves! If you like to laugh at sophisticated adult entertainment, you’ll love it. “I never laughed so hard – Beverley and Jacqui were hilarious!” – Walter M.
“I caught the show on Saturday and I’ve never seen a better Fiona – Jacqui was fabulous! The show was just great!” – Ron B. “Some of the people I was with had never been to the Playhouse before – in fact, this was their first theatre experience – and they LOVED it. We all loved the play and we love the Ivoryton Playhouse.” – Rebecca R.
“That was one of the best shows I’ve seen at the Playhouse. I wish I could go back and see it again.” – Chris S.
“What a laugh. Just what I needed! 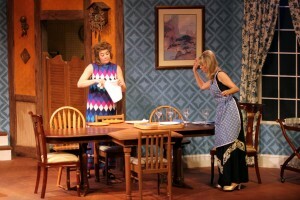 You can’t beat a good British farce when it’s done this well!” – Steve P.
How The Other Half Loves runs until May 1. What do you love / miss / dream about England? Here’s a few of my favo(u)rite things: Proper sausages, the ritual of Sunday papers, anything from Marks and Spencer, the York Races, restaurants open past 10:00pm, pitchers of Pimms served in patio gardens, Selfridges at Christmas, the utter determination of fans that England will win the next World Cup/Euro /or any other championship (but they never do), Chelsea FC, Tommy Cooper, Rising Damp, Alan Partridge, a totally gorgeous new band called Hurts, huge music festivals like Glastonbury……..so many things………..
Share your favourite British things by leaving a comment and then make your way to the Ivoryton Playhouse to see the great British comedy How The Other Half Loves!! Did you know that two of the main characters in How The Other Half Loves are Jacqui Hubbard, Playhouse Executive / Artistic Director; and Beverley Taylor, Company Manager? Both these BFFs are English and bring a lot of personal experience to their roles as Fiona and Theresa respectively. While we miss them in the office, we are excited to see them together on stage. How The Other Half Loves opens Wed. April 13. Come and see Jacqui and Bev performing on stage together for the first time in ages! !